Galerie Kenilworth’s exhibition of Emily Tripp and Brennen Steines is playfully potent stuff. 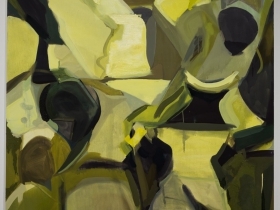 Emily Tripp and Brennen Steines, “Within and Against,” Galerie Kenilworth, 2201 N. Farwell Ave., through January 6. Photo by Daniel McCullough. Looking through the large plate glass windows of Galerie Kenilworth’s current show, “Within and Against”, I had a flashback. About a decade ago, I was at a friend’s Fox Point home early on a foggy morning. As I walked into the living room I was amazed to see a huge buck grazing on a patch of grass inches from the window, the breath from his dewy nostrils visible on the glass. As I slowly neared, he noticed me and with the power of a rocket, jumped what seemed to be 25 feet over the ravine. The window flexed from the power of his movement. That’s the kind of energy I felt from this art. I have found that the best abstract art is extremely real and the best realistic work is extremely abstract. The abstract paintings of Emily Tripp and Brennen Steines, two emerging Milwaukee artists, have a reality and vibrancy that is exciting and adventurous. Most of the work in the show was done in the last year in their shared Bay View studio. 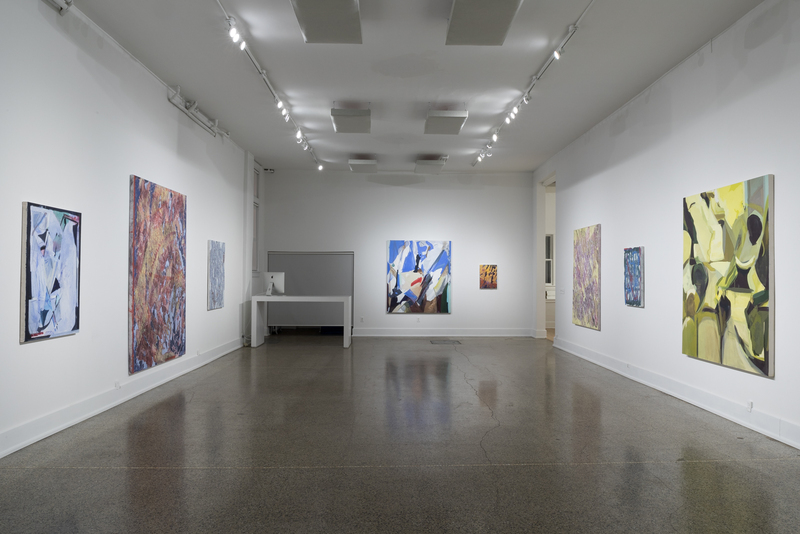 In the gallery the paintings are interspersed, each piece mingles with its familiar but separate neighbor and allows the viewer to make associations between the work in both composition and color. An essential element in each artist’s work is play. Tripp cuts and collages her old paintings and that of others she collected from UW-Milwaukee Art Department’s lost and found (both her and Steines recently graduated from UWM under the tutelage of many, including Shane Walsh and Leslie Vansen). She then uses these collages as her inspiration which she lights and paints from. A few pieces such as, “The Struggle of Fish Swimming” and “Edgewood” have areas that seem to be lit simultaneously from within and without as sinuous lines flow across and through different areas of the canvas. 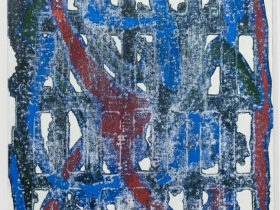 This searching and finding is also apparent in Steines’ work, where elements from his immediate environment are literally rubbed into his canvases. Much like a rubbing of a gravestone with a crayon on paper, Steines uses painted canvas and a power sander to record his immediate environment, finding and uncovering life’s overlooked beauty hidden in plain sight. I recently visited their studio building and as I walked in, noticed a sewer grate that was used in “Runic”, one of the paintings in the show, and felt like I was partaking in the artistic treasure hunt. In Tripp’s work, the the entire surface is considered and unlike single point perspective, where all lines lead to one specific point on the horizon, this work has multiple points of perspective all over the canvas. This produces pockets of space and light that create a visual topography of dynamic energy. In contrast, Steines’ uses literal topography and brute force; his work has the immediate and shallow space of a scraped and peeling wall with nuanced and ragged wallpaper edges revealing layers below. Much of his work is done horizontally and is inhabited, walked on and worn in. Upon closer inspection there are areas in his work that are finally detailed and adorned; In a painting like, “Vestige” there is what looks like a large, diagonal tire track delicately outlined in threadlike crimson paint. It reminded me of “A Bigger Splash” by David Hockney, who painted a splash in a pool, an event that happened instantaneously, but took him days to complete. In the lower right corner of Tripp’s “Edgewood” we see a drip and behind it a painted and rubbed cast shadow of that drip, emphasizing it more and creating a sense of reality that plays with space and light to create feeling through color and mark. It is exciting to think of where, somewhere over the aesthetic ravine, these artists will land in a decade or two, but right now it is wonderful to relish in the energy and exuberance of their work. 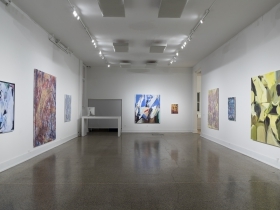 Emily Tripp and Brennen Steines, “Within and Against,” Galerie Kenilworth, 2201 N. Farwell Ave., through January 6.